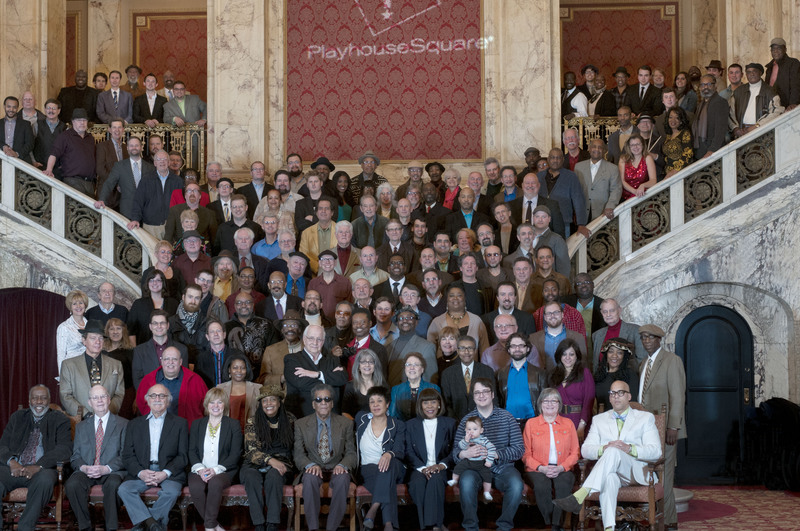 On April 9, 2014, 149 jazz musicians, writers, advocates, presenters and broadcasters gathered on the grand staircase of the Palace Theatre lobby for a photo shoot inspired by Art Kane’s 1958 Great Day in Harlem image. The aim wasn’t simply to replicate Kane’s idea, but to create the opportunity for a true moment in time for the Northeast Ohio jazz community – then capture it for history. With Tri-C students and faculty at the helm, the project turned into an emotional and joyful reunion. The lasting result is this beautiful photo taken by Jonathan Wayne’s photography class from Cuyahoga Community College’s Western Campus in celebration of Tri-C JazzFest’s 35th anniversary. We wish to extend special thanks to student photographers Jessica Halberg, Taylor Schmidt, Chris Harman, Rebekah Spurlock, Ivana Tousley, Alisha Uguccini and Andrew Cari and to videographers Adam Smalley, Kathleen Maxwell, Adam Huffman, Brandy Rankins, Thomas Rankins, Lee Bartlett, Kevin Ferguson, Nicholas Roth, Cory Sheldon, Jose Infante and Cigdem Slankard. A 10-minute video documentary by Miriam Bennett’s videography students at the Metropolitan Campus can also be seen below.